Sirus provides expert building management system services for organisations such as Bristol-Myers Squibb, GlaxoSmithKline and Pfizer. With 75% of the workforce working remotely on complex projects, the team needed a system to automate processes. However, when supplying into pharmaceuticals, any software introduced into your business must meet the requirements of Good Automated Manufacturing Practice (GAMP) 5. This standard requires you to demonstrate that any automated systems have been tested to ensure they are fit for purpose. Around three years ago, Sirus was winning many new customers and wanted a document and audit management system to be more confident in their compliance, whilst making information readily available. EQMS by Qualsys was selected by Pauline Sourdille, QHSE and Training Manager, as it would help them to demonstrate compliance to GAMP 5, FDA and MHRA - whilst providing competitive advantage. Here's how the system has evolved since it was first implemented. After opting for EQMS by Qualsys, Pauline was surprised by just how flexible the tool. And Pauline isn't planning to stop there. The next phase of the project will involve using supplier management and Qualsys supplier portals to extend Sirus' exceptionally high quality and compliance standards and processes throughout the Sirus supply chain. Supplying into life science companies? You can gain a competitive advantage by implementing EQMS by Qualsys. Configurations of EQMS have been validated to meet global regulations such as FDA and MHRA, and standards such as ISO 13485:2016. 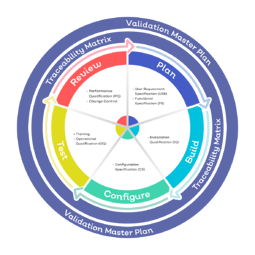 Read about our software validation process here.